A surprisingly delicious combo of salty dill pickles, sweet root veggies, spicy Old Bay seasoning in a creamy soup; serve with fries! I tell the following story with no disrespect to Michiganders (as I’m married to one) – nor to Bostonians (whom I lived among for 10 years and love dearly). People from Michigan love to tell the world that they are from Michigan. People from Boston like to tell it like it is and serve it up straight – with a side of sarcasm. Waitress: “Well lady, then you can just go back to Michigan and eat a hamburger with pickles there.” And she walked away…to return later with Clara’s hamburger, sans pickles. My kids still love to hear “Grandma’s pickle story”…practically every time we eat pickles. Which in our house is a lot. I’ve found several versions of the ‘original’ recipe online and most all contain at least a cup of heavy cream but I found that pureeing several winter veggies like potatoes and sweet rutabagas along with whole milk provides a perfect creamy contrast for the salty pickles and piquant Old Bay spice. The chunks of pickles give plenty of salty, dill flavor so no need for 2 cups of pickle juice found in some of the original recipes. We serve it often with (baked) fries like they do in Michigan. Or, recently we’ve been pairing it with these sweet-savory Bacon Egg Muffins… and beer. Cheers to you Clara; I’m so thankful for the 15+ years of memories…that began with pickles. Heat oil in large soup pot; add onion and cook, stirring occasionally for 5 minutes. Pour in broth, potatoes, rutabagas, Old Bay, black pepper and cayenne pepper. Simmer for 15-20 minutes until rutabagas are tender. In a glass measuring cup, whisk together a slurry of flour, sour cream and milk. Slowly add to soup, whisking until smooth. Add dill pickles and serve with garnishes. 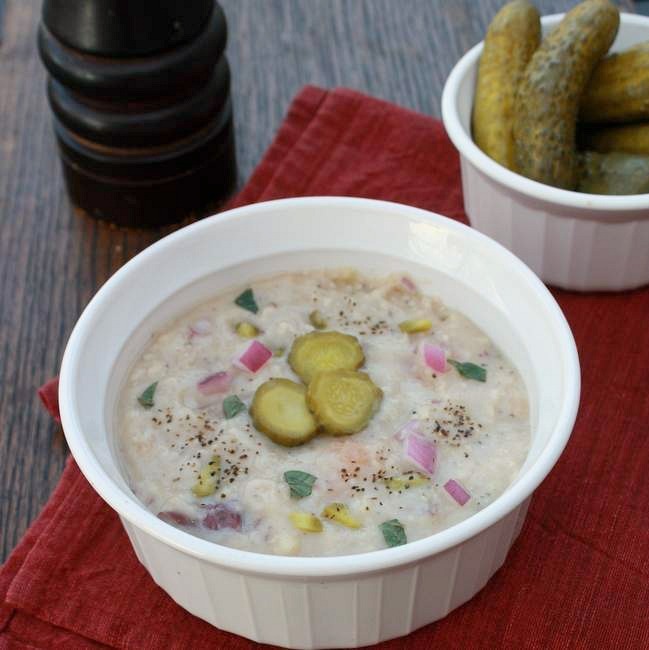 Saute onions; then add everything except flour, milk, sour cream and pickles to slow cooker. Cook on high for 4 hours or low for 6-8 hours. During the last 30 minutes, whisk together flour, milk, sour cream; add to slow cooker and cook 20-30 minutes. Just before serving, stir in pickles. Have you ever heard of Dill Pickle Soup? In this season of sharing, please, please share a quick fond food memory! Wow, I would have never thought to use pickles in soup, but now I can’t un-think it! Sounds delish! Ann you could be the first to make it…in Georgia. It warms the soul – as much of your soul-satisfying food does! what a fun and creative recipe! love it! I’m not from Michigan, but I’m with your mother-in-law, a hamburger needs pickles. I love discovering regional specialties, and this one looks like nothing I’ve seen before. Thanks for opening my eyes to something new. Speaking of regional specialties, did you see the NYT article of Thanksgiving dishes around the country that Gretchen shared above? 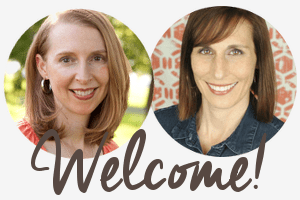 So fun – and yummy! New ones to me. But not the venison steaks from Montana – where I’m from! Hahha that is so Boston 🙂 Though I don’t understand why a hamburger place wouldn’t have pickles either!! I LOVE pickles, but have never even considered having them in a soup. Such a fun idea!! Thanks Sues. The no-pickles policy is a mystery to me…that is 15 years old and will probably never be solved. And don’t you love Boston?! What a creative recipe!! 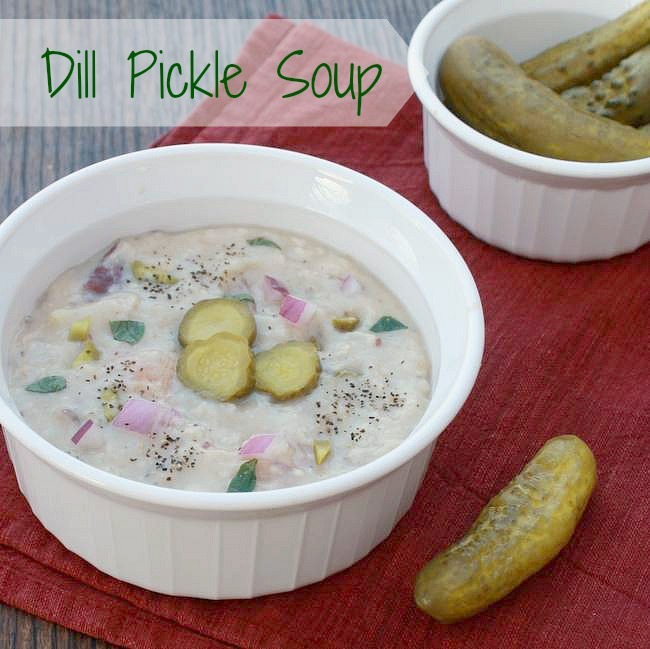 I have never heard of dill pickle soup before, but I would definitely give it a try. Loved your story. Thanks for sharing!!! O my gosh! Haha, that’s so funny! Well,l I have never heard of this, and I am from Michigan! It sounds intresting. Now I am curious which restaurant is famous for its dill pickle soup? Kelly // The Pretty Bee: Cooking & Creating recently posted..Vegan Cornbread Casserole. I was waiting for someone to discount my mother-in-law’s story….hmmm. She likes to tell lots of stories – along with telling people she’s from Michigan! This is so weird…but I LOVE it! We almost moved to Boston a few years ago. Now that I know they have something against pickles I am so glad we’re still in SC! Oh SB… this made me laugh out loud. Love it! I can only imagine that if that same scene had played out down south, the food service personnel would’ve been sweet as pie to her face, but behind her back, would have RAKED HER OVER THE COALS #BlessHerHeart. Ha! I’ve never had or heard of pickle soup. Interesting!! I love this look! Look really beautiful! Woah! I have never heard of pickle soup, but I’ll have to share with my sister, Madam Pickle! Haha! Might Madam Pickle be sipping her soup soon? hilarious… i’m surprised dill pickle soup didn’t make the cut to represent michigan in that new york times article (http://www.nytimes.com/interactive/2014/11/18/dining/thanksgiving-recipes-across-the-united-states.html). this is so unique! i’m fascinated! If she likes pickles, I’m sure I’d like her too. Hope you get a chance to make with her! This is such a good idea! I’m sure I would love this…I can eat dill pickles in mass quantities!!! Whoa! 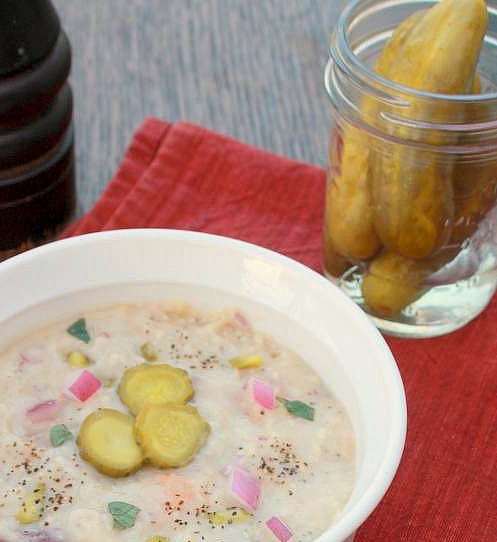 I’ve honestly never heard of Dill Pickle Soup and now I feel like I’ve been missing out. I definitely need to try this one soon! Let me know if what you think Sonali! It’s good comfort food. LOL I can’t believe anybody talked that way to Grandma Ball, but I’m a mild-mannered midwesterner. If you can’t have pickles on a hamburger in Boston, I never want to go there. Love that story! You weren’t kidding about bostonians telling it like it is. I’ve never heard of dill pickle soup but it sounds wonderful. NO WAY. I love dill pickles but never thought to have it in a soup!!! Confession- I may or may not enjoy drinking the pickle juice…then skulling water ha. Hah! I love this story. I’m born and raised in the Boston area and I’m not surprised by the reaction of that waitress! My fiance will love this recipe. Very unique- I would have never thought to do this. I hope I don’t hurt your feelings, but I don’t think I’ll be making pickle soup anytime soon. But to amuse you, I’.. share my pickle story. When my son was little he loved pickles, so much so, that one time after eating the last pickle from the jar he decided to drink the juice, too. He hasn’t touched a pickle in 18 years.